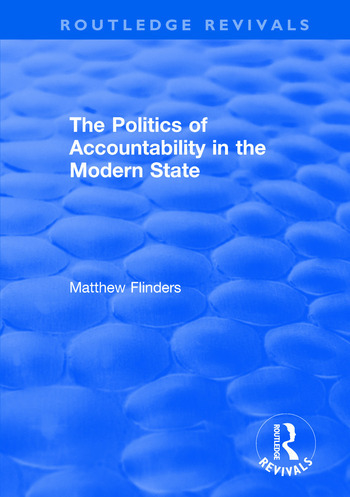 This title was first puplished in 2001: In this compelling work, Matthew Flinders examines how far alternative forms of accountability have evolved and the extent to which they remedy the current shortcomings of the parliamentary system. Adopting a pluralistic perspective, this exploration of the accountability of the core executive is clearly grounded in research methodology, thus ensuring the book makes a valid, incisive contribution to the literature. Features include: - A detailed study of the location of power and mechanisms of accountability in modern government which challenges the largely prosaic existing literature - Useful summaries of the key tensions and trends within constitutional infrastructure - A new and refreshing approach to the study of central government - Insightful critiques of major governmental policies This intriguing volume will be of interest to undergraduates, post-graduates and lecturers for courses on legislative studies, central government reform, public administration, British politics and research methods. Contents: History and Theory: Reinventing accountability. Accountability Models and Case Study Analysis: Parliamentary accountability: demoralised or revitalised? ; Parliamentary accountability and the Home Office; Judicial accountability; Judicial accountability in the Home Office; Managerial accountability and the contract state; Managerial accountability and the Home Office. Freedom of Information and Conclusion: The executive morality and inverted conventions: ministerial responsibility and freedom of information; Understanding the politics of accountability; Methodology; Bibliography; Index.